John Smith was a key player in GM's' European expansion. John Smith, the 59-year-old General Motors Co. lifer whose retirement was announced last week, had an uncommon career. 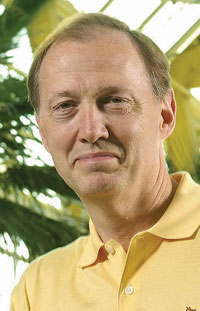 As group vice president of corporate planning and alliances, Smith led the successful effort to unload Saab and the failed effort to sell Hummer to a Chinese company. But for most of his career, he was a builder rather than a seller. And two decades ago, while head of planning at GM Europe in Zurich, Switzerland, Smith had a hand in history: He was at the forefront of setting up GM's operations in the former East Germany -- the first Western carmaker to do so after the Berlin Wall fell. Smith worked in Zurich from 1989 through 1993 -- down the hall from Rick Wagoner, who was the CFO of GM Europe from 1989 through 1991. As the world was changing, Smith was the personable rising young executive whom GM Europe bosses Jack Smith and then Bob Eaton sent to negotiate the takeover of the East German carmaker Wartburg in Eisenach, East Germany. "What a great bit of history to watch," Smith once said. "A constrained population in central and eastern Europe having the chance to enjoy all the same freedoms we do. That was just great to behold." Smith returned to the United States in 1994 as president of GM's Allison Transmission. In 1997, GM's leadership summoned him to Cadillac, where he presided over the brand's return to glory. The glory was not without a touch of stain. The brand's executives were accused of lying to retain the U.S. sales leadership for luxury cars over Lincoln in 1998. The division counted almost 5,000 Cadillacs as sold to consumers in December of that year -- when in fact they had been sold only to GM dealers. Indeed, there were lots of ups and some downs in a career spent where the action was.